I'm back home after spending a few days in Ohio and Pennsylvania -- and we had such a great time! We attended our nephew Levi's high-school graduation, then we explored the area for a few days. 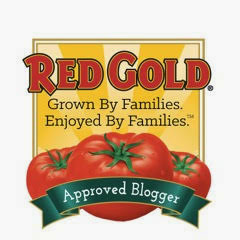 I'll be sharing all of the fun details in a culinary travelogue next month, so stay tuned. I'll tell you all about our visits to the Pro Football Hall of Fame, Frank Lloyd Wright's breathtaking Fallingwater home, the Rock and Roll Hall of Fame...and Cleveland's fantastic food scene. But first...I'm excited to kick off a new monthly feature today: Wendy's Best Bites. 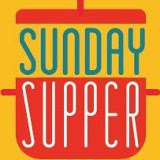 I get a chance to try seasonal and new menu items at lots of great restaurants, and I'll share my favorite each month. For June, I wanted to share some of my favorite Summer menu items. These light menu items are perfect for warm days...they'll fill you up with out filling you out. First up is the new seasonal fruit smoothies at Corner Bakery Cafe. These smoothies are made with fresh fruit and contain no added sugar. In fact, each smoothie provides a whopping four servings of healthy fruit! 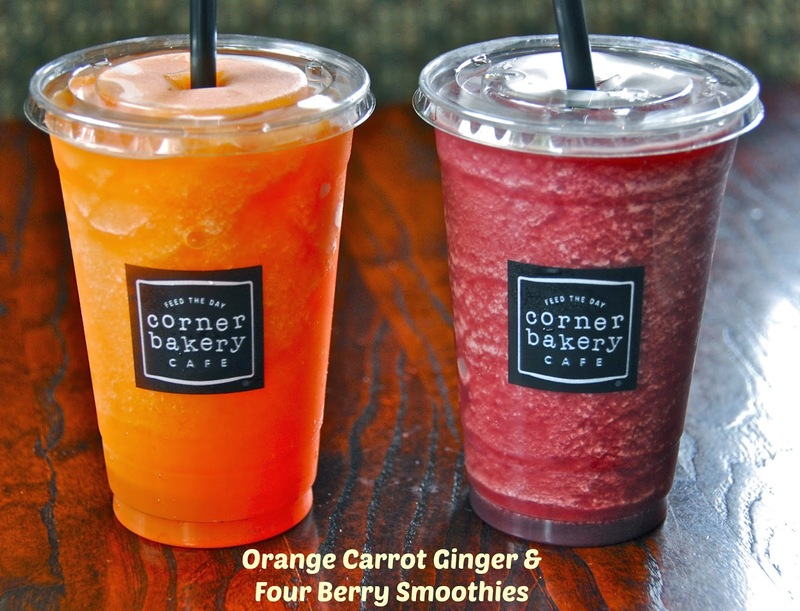 The two Summer flavors are the Orange Carrot Ginger and Four Berry. Both are refreshing and perfect for an on-the-run breakfast or afternoon pick-me-up. Michael is a berry lover, so he naturally gravitated toward the sweet-tart Four Berry. I was intrigued by the ginger and carrot in the Orange Ginger Carrot. I'm not a carrot lover, but it worked really nicely in this smoothie -- the orange and carrot blended really nicely together, and the ginger gave it a nice zing. If you live in Texas and love salads, you simply must pay a visit to your local Salata Next-Generation Salad Bar. This new-concept salad bar lets you create you own customized salads featuring your favorite greens, fruits and veggies, nuts and cheeses, and protein. Whatever creation you can dream up, they'll assemble it for you. I especially love that most of their dressings are low in fat and full of flavor! 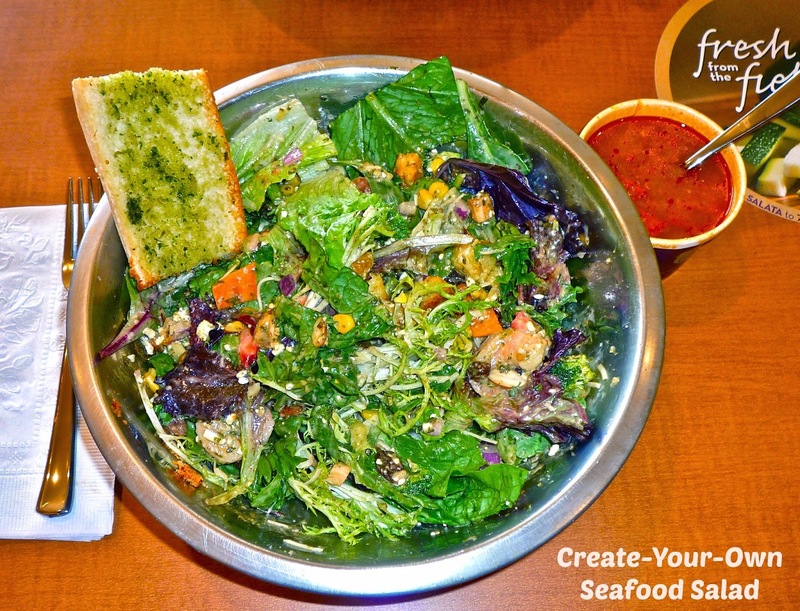 For Summer, love to focus on their seafood offerings: shrimp, Krab Salad, grilled salmon, and a tasty seafood combo. 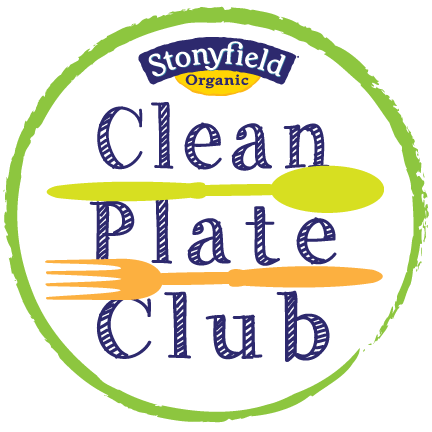 Simply select your ingredients, add a protein and dressing, and they'll toss it up and serve your creation in a large salad bowl...along with a piece of hot garlic toast. You can also pair your salad with your choice of hot soups if you like. 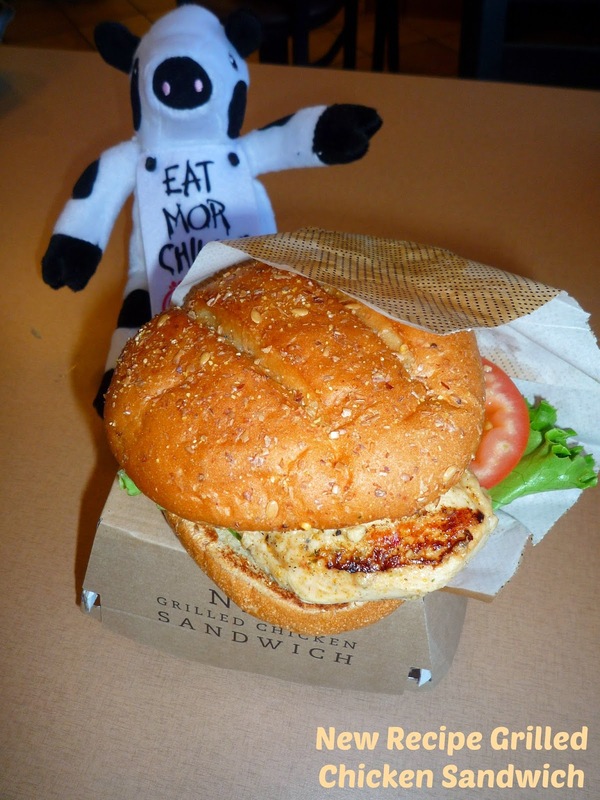 Chick-fil-a is a staple in Texas...and they recently introduced a new and improved grilled chicken. They added a zesty lemon-garlic-herb marinade, and they gave the new chicken a backyard grilled taste. I wasn't a fan of their grilled chicken until I recently tried this new recipe...now, I'm hooked on the slightly smoky taste and the juicy marinade! They offer this new-recipe chicken on salads and in nugget form, but I especially love the new Grilled Chicken Sandwich. With just 310 calories, it's served on a multigrain bun and topped with lettuce and tomato. It tastes so great that it doesn't need sauce, but a bit of honey mustard works nicely too! Did you know that Fogo de Chao also offers a handful of tasty seafood options on their menu? Until a recent visit to this grilled meat mecca, I didn't either. 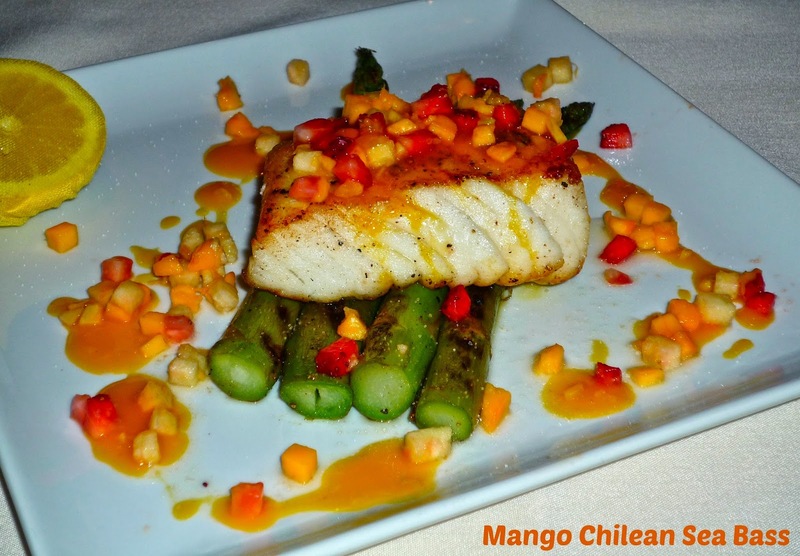 I had a chance to try their healthy...and gorgeous...Mango Chilean Sea Bass. This dish consists of a healthy portion of tender sea bass that is grilled and served on a bed of grilled asparagus. Then, the fish is topped with a tropical mango salsa that has just a touch of heat. This menu item can be ordered a la carte or paired with Fogo de Chao's signature 30-item gourmet salad bar. They also offer a fabulous jumbo shrimp cocktail that will knock your socks off! The shrimp are huge and perfectly cooked, served on a bed of ice with their house-made cocktail sauce. There you have it...my suggestions for some Summer menu that can be found at restaurants located in Texas and beyond. I can personally vouch that I tried all of these items and loved them...if you try them, let me know what you think! Come back next month to see what other new and/or seasonal menu items I've discovered. 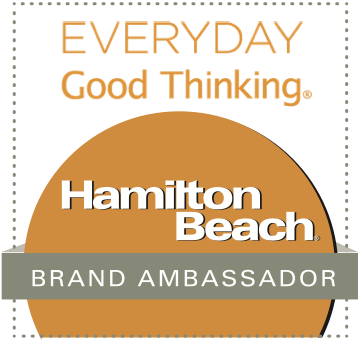 Disclosure: I was hosted by the featured restaurants to facilitate inclusion in this feature. All opinions expressed are my own, and I only recommend items that I have personally tried and enjoyed eating.